I’m so excited for you. Now that you know your plan+do™ style, you’re ready to create your perfect planner with you’re unique recipe! Knowing what page designs suit your personality + productivity style means you’ll be able to create your perfect planner to confidently plan + enjoy your day, even a Monday. 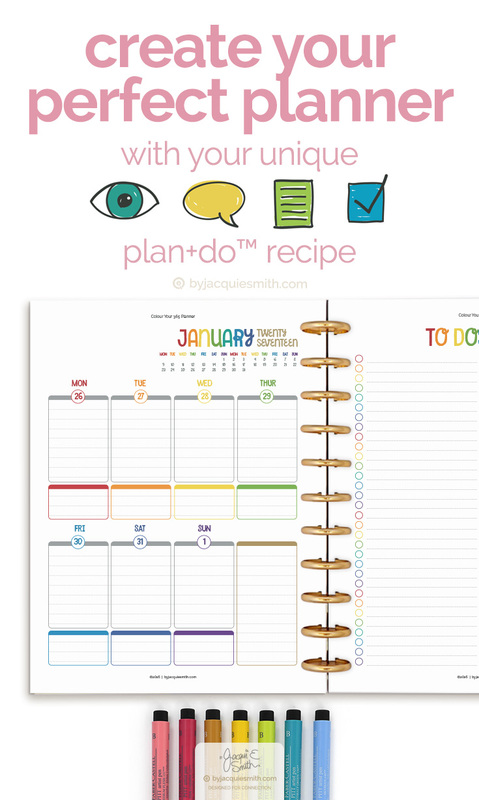 With your unique plan+do™ recipe your ready to create your perfect planner, one that works with you! Let’s dive straight in to the plan+do™ recipes today so you can get to the fun part of putting your planner together. Use these unique planner recipes with the Colour Your 365 planner kit, bursting with colour to design your day your way! #Tip : You’re welcome to discover the three things you need to know to choose your perfect planner + review the four plan+do™ styles here. Find out more about the Colour Your 365 planner here. Creatives are big picture thinkers and work best with large chunks of time for their projects + batching tasks. They love using colour when planning + doing, and need plenty of space in their planner. To have that big picture view of your week you’ll enjoy a weekly page with a master todo list. You’ll enjoy having additional note + grid pages at frequent intervals throughout your planner. eg: on the reverse side of the Month + Week pages. Expressives love connecting people and work great with smaller chunks of time for projects + batching tasks. They enjoy a little colour + crafty goodness, and like a little space in their planner. To connect the people + pieces of your week you’ll enjoy a weekly spread with a little structure and master todo list. You’ll benefit from adding additional note or grid pages at frequent intervals throughout your planner. eg: on the reverse side of the Month + Todo pages. Listers love lists. As natural wonders at planning things out, they enjoy a little more detail than fellow creatives + expressives. They enjoy using coloured pens to organise their day. To ensure all the details of your day are noted you’ll enjoy a daily page with a little structure. You’ll enjoy having extra notes pages at frequent intervals throughout your planner for creating lists. eg: on the reverse side of the Month pages + double sided notes pages through your planner. Details is the Analysers middle name. They are super efficient, getting large amounts of work done in short periods of time. All they need is their favourite pen to set great things in motion. You’ll enjoy a timed daily page to have time for everything + put everything in it’s place. You’ll enjoy having some additional note pages throughout your planner. eg: on the reverse side of the Month pages and a few double sided through your planner. You can print the pages at home on your own colour printer or take them to your local copy shop and have them printed for you. See this article for detailed instructions to print your planner pages in 3 simple steps. Using the disc system, a unique hole punch with plastic or metal discs, makes it easy to add and remove pages of your planner throughout the year. The discs can be found easily in places like Staples, Levenger, Etsy and Ebay in a multitude of colours. The special hole punch is not cheap and is the secret to the unique system. I personally use + recommend the Levenger hole punch (I bought mine on Amazon) as the pages turn smoothly. there is a measurement guide so you can easily create planners of different sizes. Ready made covers are available from places such as Staples and Levenger or you can make your own covers by laminating your favourite craft paper or prints. A terrific alternative if you don’t want to laminate a cover is to use clear plastic kitchen cutting mats. And it’s super quick + easy to change your cover. There are a multitude of planner binders on the market. The Colour Your 365 planner is designed specifically to work with both A4 + US Letter paper sizes so you can choose your favourite planner binder and simple hole punch and insert your pages. Like the disc system it’s easy to add or remove pages from your planner with ring style binders. See this article for more detailed information about planner binder sizes. Unless you have your own binding machine, you’ll need to visit your local copy shop to have your printed pages spiral bound. Each copy shop will have samples of the kinds of spiral binding options for you to choose from. Unlike the disc and binder options, you can’t easily add pages to this style of binding. With your unique plan+do™ recipe, printing + binding options you’re ready to create your perfect planner. If you have any questions, please contact me, I’d love to help.